The F-35! 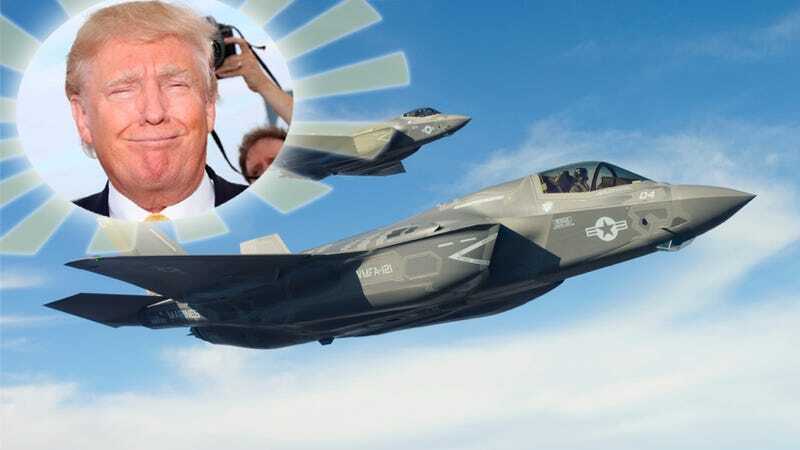 It’s “not very good!” It’s “out of control!” It’s comes at a “tremendous cost!” It is also a “great plane” now, because President Donald Trump has fixed it. But we cut approximately $600 million off the F-35 fighter, and that only amounts to 90 planes out of close to 3,000 planes. And when you think about $600 million, it was announced by Marillyn, who’s very talented, the head of Lockheed Martin. I got involved in that about a month ago. In case that’s hard to read, Trump appears to be claiming a reduction of $600 million off the price of a collective 90 planes, which would make up the most recent lot of F-35 production. His own basis for the claim appears to be from the fact that he started meeting with defense contractors in late December of last year, ostensibly in the hopes of negotiating a price reduction for the planes. But, as is typically the case for these sorts of of things, it turns out Trump had nothing to do with it. At all. As the Post notes, the head of the F-35 program at the Pentagon announced a cost reduction of six to seven percent per plane on December 20th, days before Trump’s team actually started meeting with the defense industry. And better yet, even though the price reduction was announced in December, it turns out it had been planned for years, because the F-35 was always designed to get cheaper as the program advanced, as Aviation Week’s Lara Seligman pointed out on Twitter. It turns out that when you build more of something, each individual unit gets cheaper to produce. Of course none of this fixes any of the underlying problems of the F-35. But it’s a great plane now, though, so I wouldn’t worry about it too much.